The fragrance of fresh birch and pine was invigorating! Golden rod and wild grasses along the road’s shoulder leaped forward with a punch of colour. The road shone. It had just rained, and gauging by the amount of water left behind, the Road King and I had only just avoided a huge soaking. “Thank you” I whispered to mom nature for staging this incredible panorama for me to ride. The pavement glided on below me, bending and straightening over and over. I moved the bike along naturally, constantly. The mighty Road King no longer shone. Water and debris from the road muddied its chrome. I thought about Harley enthusiasts I’d meet along the way, shaming me for its unkempt appearance. But then I’d explain that there was this great road, a wilderness road, no ‘cages’—just the pure sensation riding calls up. The only sound is the rumble of the Road King’s twin engine beating in time. All this on the road from New Liskeard to Elk Lake and back. They’d imagine—they’d understand. 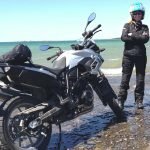 With a thrilling sense of adventure, I watched Toronto disappear in my rear view mirror as I rode to the north and around Lake Temiskaming shores. 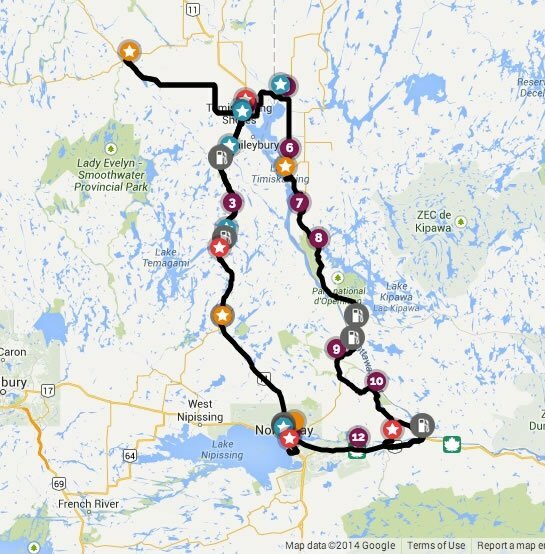 I covered a good stretch of road—nearly seven hours on the bike—Toronto to Sudbury and then overnight in North Bay. I can still taste the fresh pancakes I devoured from the Holiday Inn’s breakfast buffet. To think that I almost bypassed them to save time and get to North Bay Cycle. I’d recently met up with Jody and the North Bay race group at recent Vintage Road Racing Association (VRRA) Mosport venue and had promised to drop by the shop. We enjoyed a terrific visit filled entirely with motorcycle chit-chat. And I confirm—the rumours are absolutely true—North Bay folks are as friendly as they say! 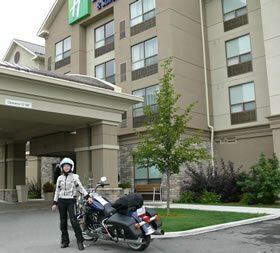 Leaving North Bay, I rode further northward on Trans-Canada Highway 11 toward Timmins and Cochrane. It was easy to keep the throttle steady; the road was simple and uninterrupted. 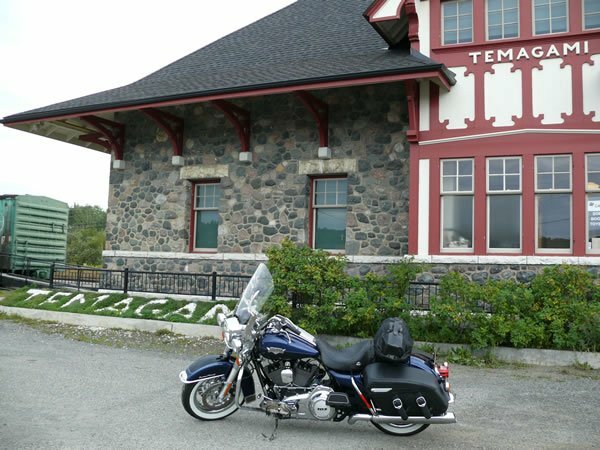 I won’t forget the town of Temagami—I’m happy I took the time to visit the eye-catching old train station on its main street. It’s a restored original, built in 1907. Jenny, who was just finishing up her summer job at its info centre inside, told me Temagami was known for its majestic rare old red and white pines. The pine finished interior underlined that fact magnificently. Yes, yesterday was perfect, and then—riding south on this Elk Lake run back to New Liskeard for the night—I found myself in the very same rainstorm that I’d had the fortune of avoiding earlier. It hit hard in a teeming downpour. Darn, I wish I’d worn my waterproof gloves! I spied the turnoff leading to Kap-Kig-Iwan Park, hoping to get a glimpse of its white water rapids from the Englehart River. I was its only visitor; the weather had chased others away. I, too, opted not to leave the bike and instead turned around with a mental note to revisit on a sunnier day. When I arrived in New Liskeard the rain had subsided but the clouds on the horizon said it would return soon. It seemed like a good idea to meet Doug and Kim at the lakeside Roosters restaurant by taxi—avoiding an inevitable soaking later on the Road King. Doug and Kim promote, manage and enthusiastically partake in the annual New Liskeard Bikers Reunion. Through our hors d’oeuvre and tasty entrees, they shared accounts of the incredible growing popularity the event has had over its thirteen years. 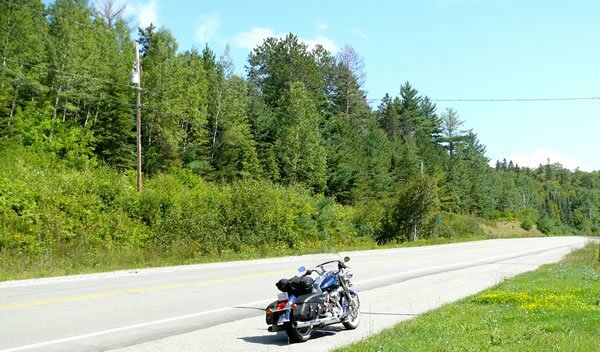 Literally thousands of motorcyclists arrive in New Liskeard to enjoy local rides and camaraderie—a full agenda of fun. The event is motivated by the goal of raising funds for the Cancer Care Unit at Temiskaming Hospital. I was convinced: this was one event I better not miss out on next summer and marked the 28, 29 and 30 of June in my calendar. On the northern road again! “Up and at ’em,” I heard myself say. Day three and the northern roads are waiting! 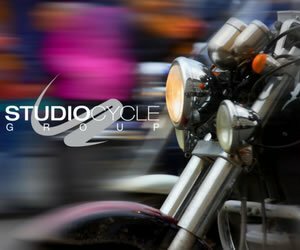 I jumped out of bed and peeked outside the window—the foremost task of any motorcyclist’s waking moment in anticipation of the ride ahead. The Road King stood as a barely visible outline in the surprising and unexpected sight of thick fog. It reminded me of Austria, the Alps: almost all mornings were exactly like this. I decided to take my time, allowing it to lift before heading out. It would be safer to travel with better visibility. I lounged around my spacious Holiday Inn apartment suite and then made my way downstairs to consume numerous cups of coffee and, of course, pancakes. The fog lifted; I tied my cargo bag to the passenger seat and stuffed everything else in the Harley’s saddlebags. Just down the road I intersected Highway 65 East. 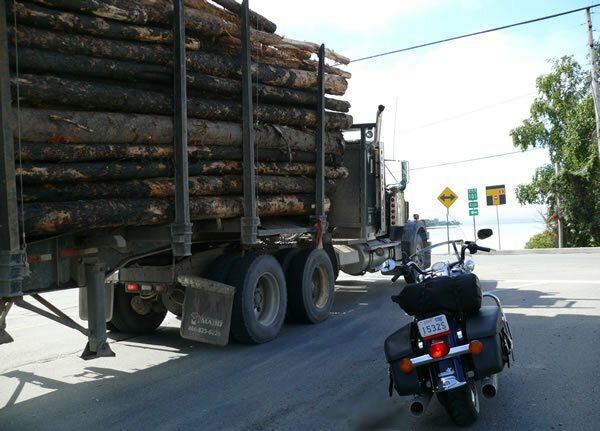 Every so often a logging truck stacked to the brim with logs passed in the oncoming lane. It scattered small bits of bark through the air and left a delicious potpourri of fresh cut wood scents. It wasn’t long before I began to observe the en français tones filtering their way to life in the town’s names and business signs. Soon ahead, there it was: “Bonjour!”—the sign welcoming my crossover into Quebec just 22 kilometres from New Liskeard! I was now rounding the northernmost tip of Lake Témiscaming (its French spelling). 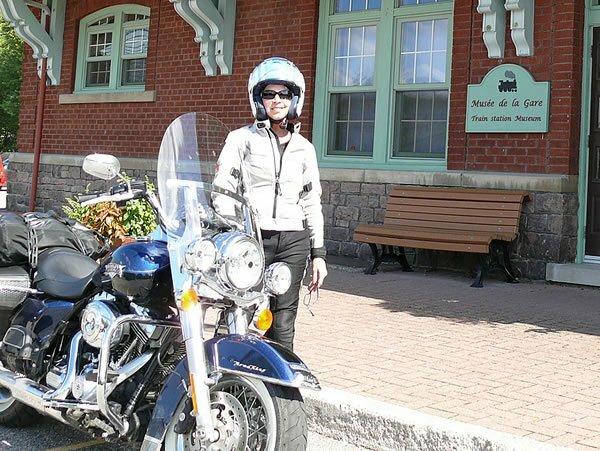 I throttled the Harley through the silent, quaint village of Notre-Dame-du-Nord where Highway 65 East intersects the 101 South. It continued across a narrow section of the mighty lake. 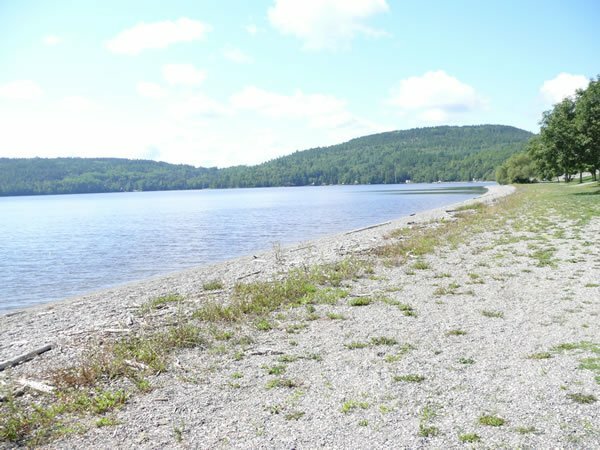 The scenery from Ontario to Quebec rolled on ahead in a combination of plateau, escarpments and the lowlands with changing elevations and Lake Témiscaming emerging then disappearing between the woods. An hours’ riding passed quickly. I turned right at the Chemin du Vieux Fort to visit Fort Témiscamingue, the national historic site. It sits on the northwest corner of the Ottawa River where it turns from west to southeast. I walked toward the entrance and left the Harley-Davidson Road King ticking—the random sounds of its cooling hot parts—in a shaded parking spot. The fort’s shores were edged with small water smoothed white rocks. I walked the grounds, exploring the amusingly recreated scenes of the fort’s olden activities. Tall white tee-pees, a canoe craftsman’s shop and trader scenes on the hill and shore invited me to imagine myself as an explorer or trader too. Well, in fact I was an explorer—only I had arrived by motorcycle which, given the choice, they might have done, too. Riding a motorcycle always seems to rouse my appetite; I was ready for lunch. I rode down the road to the La Bannik Recreotouristic camping site nestled at the base its conifer inhabited mountain. 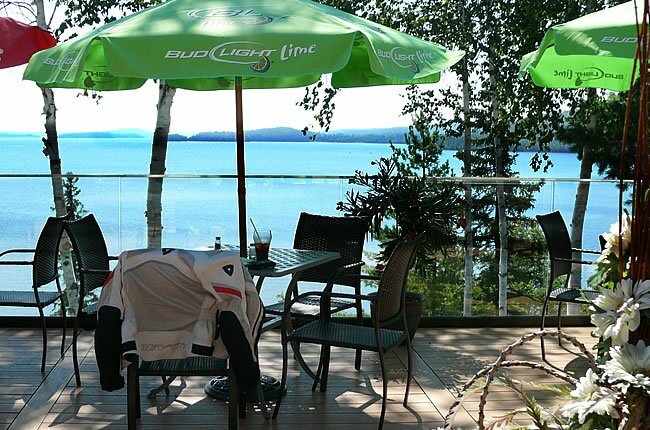 La Bannik Restaurant featured a falcon’s eye lake-view. I sat out in the outdoor deck settled among the white birch tree tops. A westward view directed me toward the mid-day sun, which lit up the lake as though blanketed by diamonds. I sipped my iced-tea, imagining it might be glasses of French red wine—if I hadn’t planned to continue riding. The lively French conversation at the bistro table next to me lent the perfect accent to every savoury mouthful of my tomato basil thin crust pizza. Southward bound along Highway 101 South and still in Quebec, a little less than an hour brought me to the town of Témiscaming. Riding through its main street, I turned into the Train Museum: Musee de la Gare. You might think I’m a train enthusiast—this being the second train station stop during this ride—but I just can’t resist admiring these unique historic buildings. The museum had a fine collection of historic remnants on display detailing its activities since 1927. I enjoyed its authentic wooden benches, all with real old baggage at their sides, packed and readied for whatever journey awaited ahead. 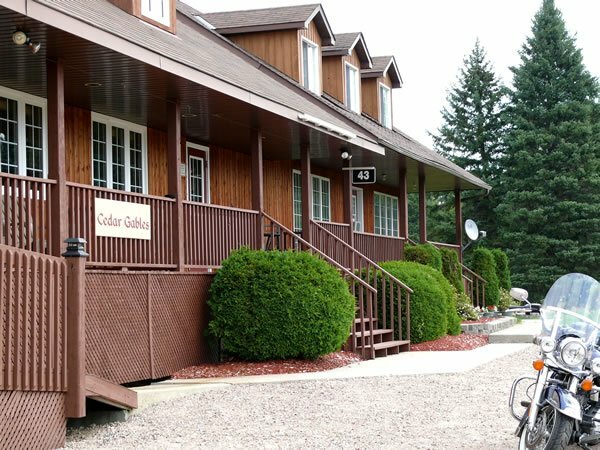 My plan was to arrive at the Cedar Gables Lodge, Bonfield before the sun bowed too low in the sky. I’d crossed the Ottawa River and returned to Ontario via 63 south. Rather than stay on 63 through to North Bay and then East again on 17 to Bonfield, I decided to take highway 533 the Mattawa shortcut. It wouldn’t shave a lot of time off the journey, but would provide more of an adventure. Two Harley fellas I’d met earlier in Temagami had cautioned me about the 533’s poor road surface and stretches of loose gravel. I appreciated the alert yet was undeniably sparked with the thought of a challenging ride. I turned onto the 533, accelerating with caution. This wasn’t bad, I thought. It was a sort of concrete mixture of stones and paved patches here and there. And then it metamorphised into the rough and bumpy surface they’d described. I reduced my speed and “worked it”, doing my best to avoid the rough patches. 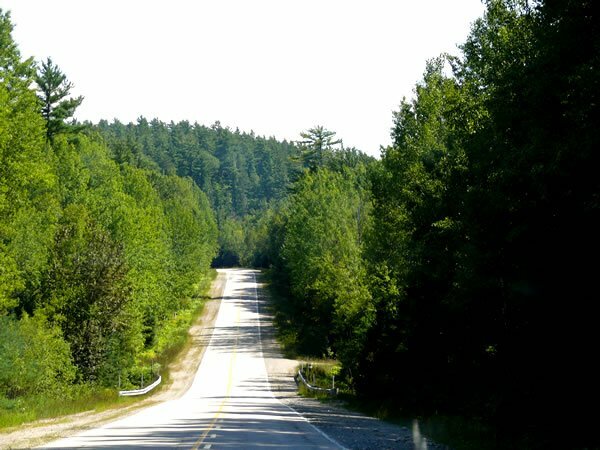 The road narrowed, twisted, then widened and narrowed again for 52 kilometres—and I loved every minute of it! The woods stood close to the road and, at times, its canopies concealed me from any rain which threatened to fall. Its side lanes posted No Trespassing warnings. They seemed to lead to campsites or logging sites by way of reddish coloured sand-like soil. I had an itching for an off-road bike, imaging how fun these would be to ride! The logging trucks used the shortcut too and had no qualms about ploughing by me with force which, as it happened, always seemed to be around the gravel sections of the road—covering me in dust. Yes, I’d take short cut 533 again just for the thrill of the ride, but not necessarily to save time. After a quick spin around Bonfield Village and an animated conversation with two bold little five-year old girls playing near the stop sign, I turned around, realizing this was not where I’d find the Cedar Gables Lodge. Back to Trans-Canada 17 it was. I could spy the sign on Road 3 Line North to Cedar Gables Lodge, just across the road. Joanne and Darcy Watson were waiting for me and had set out a side stand plank of wood to park in the gravel—a nice welcome mat, so to speak. After a delicious homemade veggie stir fry, a cold beer and conversations which generally only occur between old friends, I climbed into the high, four poster bed and fell fast asleep to the serenade of the Cedar Gables own cricket orchestra. The Road King was loaded and ready for the journey back into Toronto. I bid farewell to the Watsons and their perfect inn amidst the cedars. I headed down the lane, grasping the Road King’s handlebars with a reluctant tug—like a parent taking its child who didn’t want to leave the playground. In four hours I’d be sitting amidst Toronto’s hot, raging rush hour traffic. 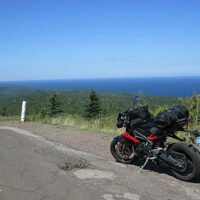 I turned onto Highway 17 East, revved the Harley up high and shifted to the next gear. I gazed at the view behind me in its mirrors, this time seeing only the reflections of Lake Temiskaming. It was that view I’d hold onto for the ride home to the city—for as long as I possibly could.